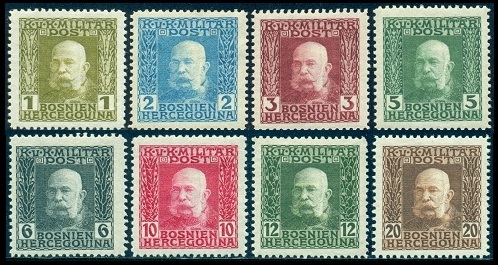 Between 1912 and 1914, Bosnia Herzegovina replaced their pictorial definitive national landmark series of postage stamps. The designs of the twenty-one new definitive stamps shown above (Mi. #64-84, Sc.. #65-85) were issued between 1912 and 1914. Their designs feature various portraits of Emperor Franz Josef I. The Heller denominations are engraved on white paper, and the Kroner denominations are all engraved on colored paper. All of these stamps are perforated 12 1/2. 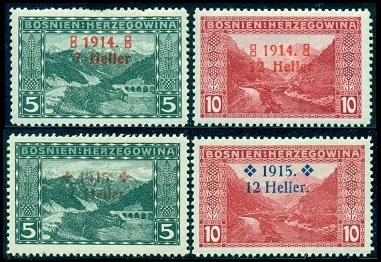 As with previous issues, these new Bosnia Herzegovina stamps exist imperforate, in pairs imperforated between, plate proofs, trial color proofs, and essays. Many of them are very affordable. 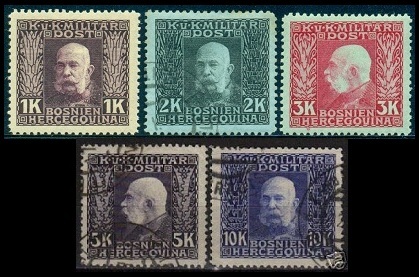 The four newspaper stamps shown above (Mi. #85-88, Sc. #P1-4) were issued October 15, 1913. Each of the four denominations features a young Bosnian girl. The designs were lithographed on thin white paper and all of them were issued imperforate. The 6 H. and 10 H. denominations also exist on thick paper. 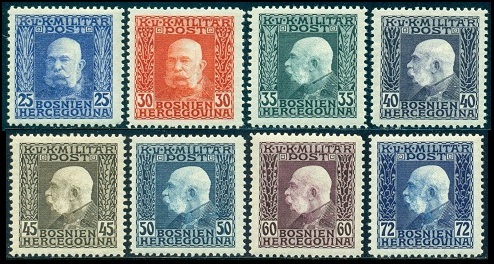 After the end of World War I, these designs were re-issued both perforated and surcharged for use as regular postage stamps by the government of Yugoslavia. The two charity stamps shown above, at the top (Mi. #89-90, Sc. #B1-2), were issued on November 1, 1914. They were overprinted and surcharged to aid wounded war veterans. Varieties of the surcharge include (1) Narrow "4" with closed top, (2) Wide "4" with closed top, and (3) "4" with an open top. The first type is the least expensive of the three. The two charity stamps shown shown above, at the bottom (Mi. #91-92, Sc. #B3-4), were issued on July 10, 1915. As with the previous year's overprinted issue, they were overprinted and surcharged to aid wounded war veterans. These two issues also exist with double and inverted overprints. They are not very expensive. The two charity stamps shown above, at the left (Mi. #93-94, Sc. #B5-6), were issued on December 1, 1915. They were also overprinted and surcharged to aid wounded war veterans. These two stamps exist in four types, differing in the length of the surcharge lines. The two charity stamps shown above, at the right (Mi. #95-96, Sc. #B7-8) were issued on February 1, 1916. As with the previous year's overprinted issue, they were overprinted and surcharged to aid wounded war veterans. These two stamps exist in two types, differing in the length of the surcharge lines. These two issues also exist with double, inverted, and misplaced overprints. They are not very expensive.